Humanities Nebraska to simulcast “U.S. and Them” lecture on American Education. “Catching Up or Leading the Way: American Education in the Age of Globalization” is the title of the final lecture of the 2013-2014 E.N. Thompson Forum on World Issues, scheduled for Tuesday, March 18. Humanities Nebraska will collaborate with six colleges and universities to simulcast the lecture across the state. Internationally renown scholar Yong Zhao will deliver the lecture at the Lied Center in Lincoln. Simulcast programs will begin at 7 p.m. (6 p.m. Mountain Time) and will be followed by a community conversation at the following locations: Central Community College in Columbus, Hastings College, the University of Nebraska at Kearney, North Platte Community College, the University of Nebraska at Omaha, and the Midwest Theater in Scottsbluff. Both students and community members are invited to join in viewing the lecture and discussing its implications, in order to allow a greater number of Nebraskans to benefit from outstanding speakers on important topics. The events are free and open to the public. Free tickets are required only for the Lied Center in Lincoln and guarantee a reserved seat there. The question of America’s role in the world today is at the heart of this year’s E.N. Thompson lecture series “U.S. and Them”. It is a cooperative project of the Cooper Foundation, the Lied Center for Performing Arts, and the University of Nebraska-Lincoln. 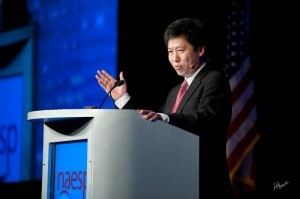 Yong Zhao is an internationally recognized scholar on the impacts of globalization and technology on education. He currently serves as Presidential Chair and Associate Dean for Global Education at the University of Oregon, where he is also Weinman Professor of Technology and a professor in the Department of Educational Measurement, Policy and Leadership. More information about the E.N. Thompson Forum on World Issues is available here. For more information about the simulcasts, contact Mary Yager at Humanities Nebraska, (402) 474-2131 ext. 103 or mary@humanitiesnebraska.org.